Explore the very best attractions San Diego has to offer with something for everybody, from the very popular to the less well known, all from a San Diego native. 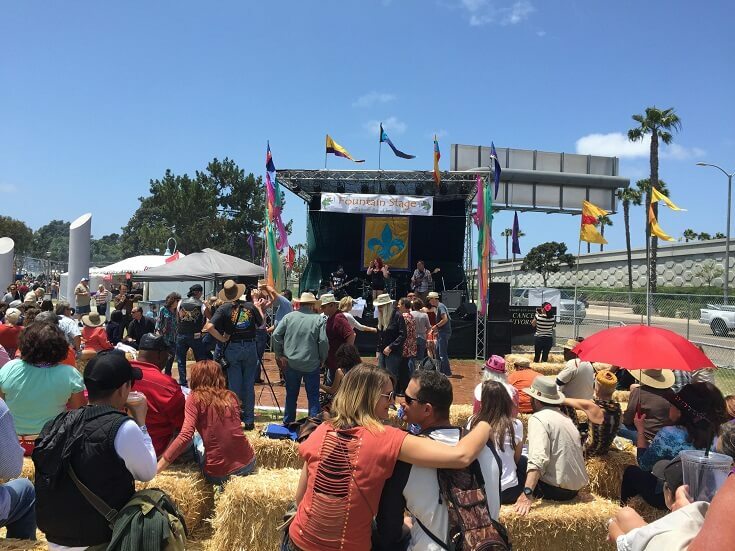 Every year on Mother's Day weekend, San Diego hosts Gator by the Bay, a crawfish and blues music festival. Featuring real southern cuisine from New Orleans and 6 stages of great blues, this festival is something that I never miss. The 2014 event just ended and this year it was even bigger and better than ever! 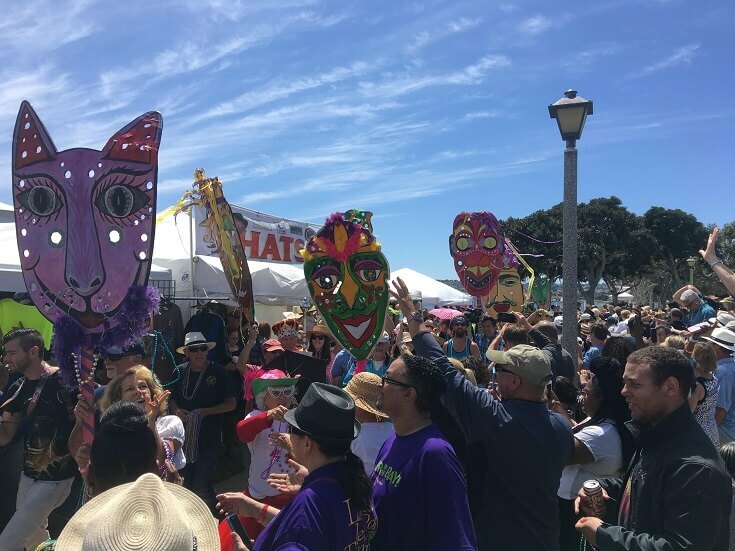 The festival is presented in part by the Louisiana Department of Tourism and many of the vendors and bands travel to San Diego for this event. It is held at Spanish Landing on Harbor Island, just a short walk across the street from San Diego's Lindberg Field International airport. Bring your folding chairs, shade tent, get setup and then start stage hopping with food and drink breaks in between ! This is one of the least known but best attractions San Diego has to offer. Harbor Island has several great hotels, including two by Sheraton. The first, and right next to Gator by the Bay, is located at 1380 Harbor Drive. The second, just down the road is located at 1590 Harbor Island Drive. Both are great places to stay and within easy walking distance from the festival but my favorite is the first Sheraton mentioned because Gator by the bay is just a 3 to 4 minute walk from the Lobby. This hotel also has a great casual bar called Quinn's plus Tapatini's, a great Tapas and Martini bar. This hotel makes one of the best Martini that I have ever tasted. For more information, please visit the Gator by the Bay home page. Perched on the cliffs of La Jolla andoverlooking the Pacific, is one of the world's most famous and best attractions San Diego has for the entire family, the Birch Aquarium at Scripps Institute of Oceanography. With over 3000 types of fish in 16 various habitats, this is a must stop for the visitor to San Diego. 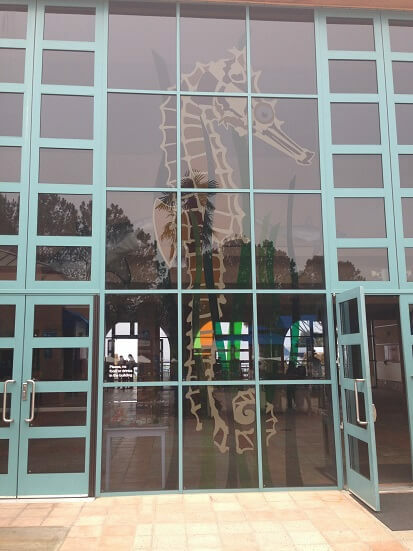 Exhibits include the shark reef, living tide pools, coral reef, kelp forests, whale, seahorses and more. The entrance fee is very reasonable at $17 for adults, $13 for seniors, $12.50 for children ages 3-12 and $14 for teens. More information can be found at the Birch Aquarium home page. The flower fields of Carlsbad, in northern San Diego County, have been in existence for over 60 years. Each spring for about six to eight weeks, starting in March and through early May, 50 acres of Giant Tecolote Ranunculus flowers come to life showing their vivid colors. Visitors may walk along the paths between the flowers that are arranged in rows of contrasting colors. This is a fantastic place to spend 2-3 hours. If you are a photographer, you will have the time of your life making this destination one of springtime's best attractions San Diego has for leisurely strolling through nature. The best viewing times are usually in late March to early-mid April. Hours: Open to the public seven days a week from 9:00 a.m. to 6:00 p.m.
For more information, click on the Carlsbad Flower Fields web site. Located adjacent to downtown in beautiful Balboa Park, the world famous San Diego Zoo has been in operation since 1916. Covering more than 100 acres it is the home to over 4,000 animal and birds made up of about 800 species. Hint ! - If you plan on visiting the San Diego Zoo Safari Park, located in northern San Diego County, multi-park passes are available. 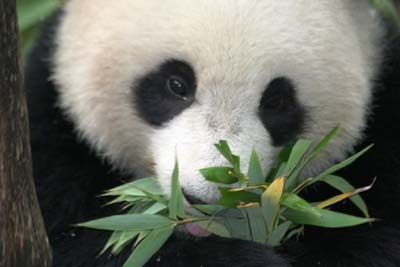 For more information click on San Diego Zoo Tickets. Safari park is about a 60 to 75 minute drive from downtown San Diego assuming little traffic. Hint ! - Don't do the drive anytime between 7am and 9am on weekdays or you will feel the pain of the San Diego rush hour for the first third of the drive. Other useful links are the San Diego Zoo website and the San Diego Zoo map. Park hours are from 10am to 6pm on weekdays and 9am to 11pm on weekends and some holidays. For more information, visit the Seaworld San Diego home page. It you have children, regardless of their ages, you definitely want to visit Legoland park in Carlsbad, located in northern San Diego county about 35 miles from downtown San Diego. Everything is made of legos, from mini-cities to castles, architecture, animals and more. In addition, there are several rides for the kids to enjoy. Don't forget the swimming suites. Legoland has something for everybody including a water park and Sea Life Carlsbad aquarium. Legoland is open 5 days a week, closed on Tuesday and Wednesday while the Aquarium is open everyday. Just recently opened, Legoland now has its own hotel. For more information, visit the Legoland San Diego home page. 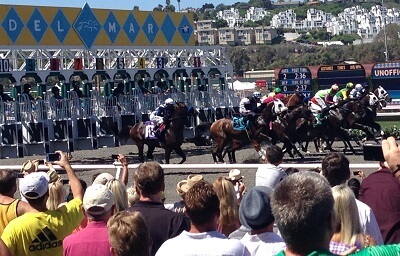 Every summer, just after the San Diego fair closes down, horse racing season starts at Del Mar. This year, for the first time, there will be two racing seasons. The first starts on Thursday July 17 and ends on Wednesday, September 3rd with races everyday except Mondays and Tuesdays. An additional November season starts on Friday November 7th and ends on Monday, November 30th racing Thursdays through Sundays. Opening day always brings big crowds and is a great event if you have never attended. 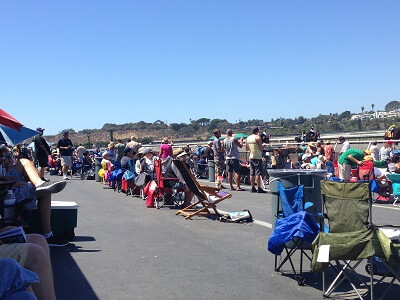 On select days, after the last race, Del Mar has live concerts. Admission is $10 for Clubhouse tickets and $6 for the open seating, Stretch Run area Opening day tickets are $20 for Clubhouse and $10 for the Stretch Run area. 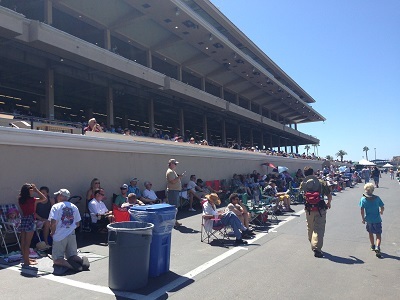 The Stretch Run area (show below) is a fantastic, open seating, bring your own chair and cooler section located just below the reserved table seating and right next to the finish line. It is also very close to the betting stations, bars and restrooms making this a favorite spot to kick back and enjoy the ocean breeze while watching all of the action. Del Mar is located about 20 miles north of downtown San Diego, just off of highway 5 in Del Mar and adjacent to the Pacific Ocean. 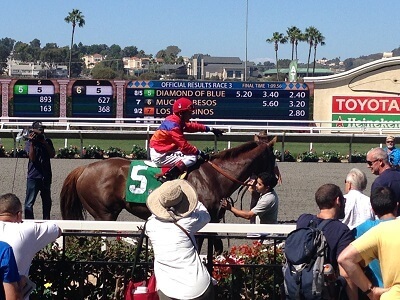 For more information, visit the Del Mar Horse Racing home page. San Diego is a world renown destination for both the professional and weekend bass fisherman. Several bass very close to the world record have been caught from San Diego lakes. The are several lakes within a 15-50 mile radius from downtown San Diego, Lower Otay, El Capitan, Barrett, Morena, Murray, Miramar, Loveland, Jennings, Wohlford, Cuyamaca, Dixon and Hodges. Further to the north in Riverside county, about 100 miles from downtown San Diego is Diamond valley, the largest and deepest man-made lake in California. 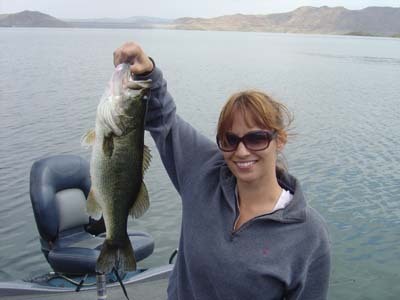 Diamond Valley has been voted as one of the best fresh water bass fisheries west of the Rocky Mountains. 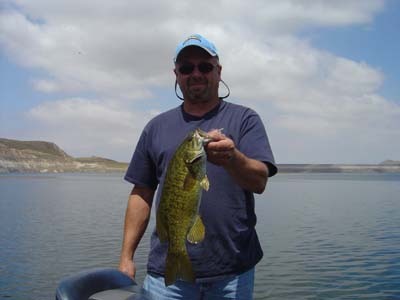 In addition, Diamond Valley lake has some great Smallmouth bass fishing. Lake Otay, Morena, Hodges, Miramar, Murray, Jennings and Dixon all produce fish in the "high" teens, pushing and sometimes exceeding 20 lbs. Lake Barrett, which has limited access through Ticketmaster (reservation only) , produces 100+ fish days of pure strain northern bass. Three days a week, a maximum of twenty groups of up to four people on lake rental boats, are allowed access to the lake. No private boats are allowed and due to the rugged nature of the terrain, dirt road and steep cliffs, fishermen must be escorted into the lake at sunrise. The lake is open April through September and the fishing is some of the best in the world. If you are a bass fisherman, this is a must do event during your San Diego vacation. I fish Barrett and other Southern California lakes on a regular basis. Should you need any questions answered, visit our Contact Us Page and submit a comment. I will get back to you quickly. 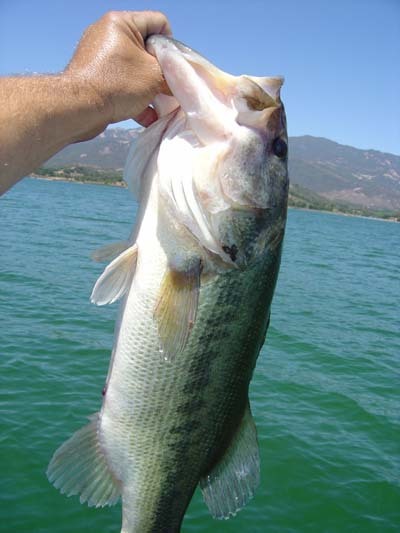 Southern California bass fishing is the best is February and March as these are pre-spawn and spawning months, respectively. However, with the mild San Diego climate, bass fishing is usually good all year long. Fall often sees fantastic jig and swimbait bites while summer will see early and late day top-water and crankbait bites. December often times brings a great jig bite while spinnerbait and topwater action can often occur. Petco Park, home of the San Diego Padres, is located in downtown San Diego just across the street from the San Diego Convention Center and adjacent to the Historical Gaslamp Quarter. This is a great place to see a baseball game because the stadium only seats about 42,000 people. All seats have great views and are angled towards home plate. Restaurants and shops have been integrated so that you can view the game while having a great dinner. There is also a center field, raised grass area outside of the stadium that you can bring a blanket and watch the game live and also on the big screen for a very nominal entrance fee. It's a great place especially if you have small children. The season starts in early April and ends in October. For more information, visit the San Diego Padres home page.